“There won’t be another Camelot. Not another Camelot.” Jackie Kennedy says to herself — both as a statement about the country passing into darker times and as reassurance about her husband’s legacy. Grief and myth collide in director Pablo Larraín’s intimate study of the person most affected by one of America’s greatest tragedies. Allow me to be cliché and call Natalie Portman’s performance here a revelation. The control of slipping between reality and artifice is incredible – her wandering around the white house with no direction makes the film feel more like a ghost story than anything resembling a biopic. And not since Tom Hardy’s Bane has a voice been so bizarrely engrossing. Shot on 16mm, Larraín’s portrait of the most famous first lady in the weeks following her husband’s death is less like an intimate portrait and more like one of those paintings whose eyes feel like they’re always following you. The constant close ups on Jackie’s face as she wanders around begins to feel intrusive. Mica Levi’s score is plucked from a horror film and follows Jackie everywhere she goes like the grim reaper taunting her loss. Such techniques are what make Jackie a cut above most biopics. We see Jackie dress up in fashionable clothes and have her hair done. We see her being filmed and then see that footage as if we’re watching on our couch in 1962. We see her assistant telling her to smile bigger for the cameras. We listen to her speak during a written interview, but if she says something too personal or revealing she demands that it be altered to her liking. These various forms of media and the presentation of her add up to create a lucid portrait of a woman whose true identity feels almost unknowable. The film’s only major slip up is it’s switching between the more abstract and grief stricken immediate aftermath of the assassination and the use of interviews and confession. Both of these methods explore her grief as means of creating myth, but the former is far more illuminating and visceral. The interview with Billy Crudup’s unnamed journalist is good for a few laughs and quotes, but it’s something you’d find in a more standard biopic and it stunts the rhythm of the overall picture. The other interview is a walk and talk confession to a Priest that’s too repetitive and doesn’t validate its use alongside the journalist segment. However, Crudup’s journalist interview does occasionally help inform the visually evocative moments of Jackie’s grief after President Kennedy’s death. Little that Jackie says in the interview can be taken as true or real — playing into the idea of her mirage-like identity. She’ll divulge some personal anecdote, puff her cigarette as the journalist begins to write, and then slyly mention that she never said that. It’s comedic and also speaks to Larraín and Portman’s larger goal. Paralleling the interview are the vulnerable moments that the journalist wants to find, but she‘ll never reveal. Only we get to see a moment where Jackie aimlessly wanders around a foggy cemetery looking for the perfect spot to bury her husband. 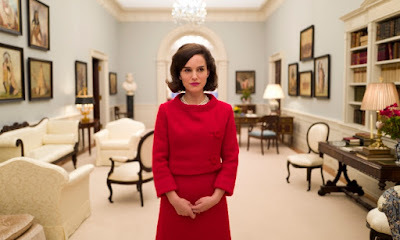 Larraín and screenwriter Noah Oppenheim’s suggestion is that Jackie sees such moments as weakness, but showing us these private moments that feel heightened is a means of embracing her myth to give us the real person. In a sense, Larraín and Oppenheim are the unnamed journalist searching for the truth. Jackie Kennedy is a mysterious woman who was most famously known by her white house tour (the early 60’s TV facade is given a light satirical stab here), but the moment that JFK is shot shatters whatever persona she’d inhabited. Now with the cameras pointing at her she has to maintain a persona that doesn’t exist in reality. Who is the myth? Who is the person? Which of these questions informs the other? Larraín’s film works when it visually attempts to print the truth by embracing the myth. It’s a big undertaking that’s messy and has long lulls in pace, but it’s also a stirring mixture of horror and sadness. Jackie peers through the media facade and attempts to look into the horror of her husband’s death and the sadness of now being alone. The former is evocatively visualized through a literal washing of blood off of her while the latter is emotionally articulated with the image of her staring out a car window as cheering crowds reflect onto her melancholy face. The means of which the film explores her intertwined myth and identity is tangled up, but the evocative sequences give us a glimpse into the real woman.